This dress is one of my favorites from my collection! I love pleated chiffon because it lays so beautifully and how perfect is this deep burgundy color for fall?! Pair it with a denim jacket (like this one) and some booties (these ones are on sale and are also available in black!!!) or even a cute hat and you’ve created a dressy, casual look you can wear all season long! You can shop my entire fall collection here. Thanks for stopping by! I hope you all have an amazing Monday! 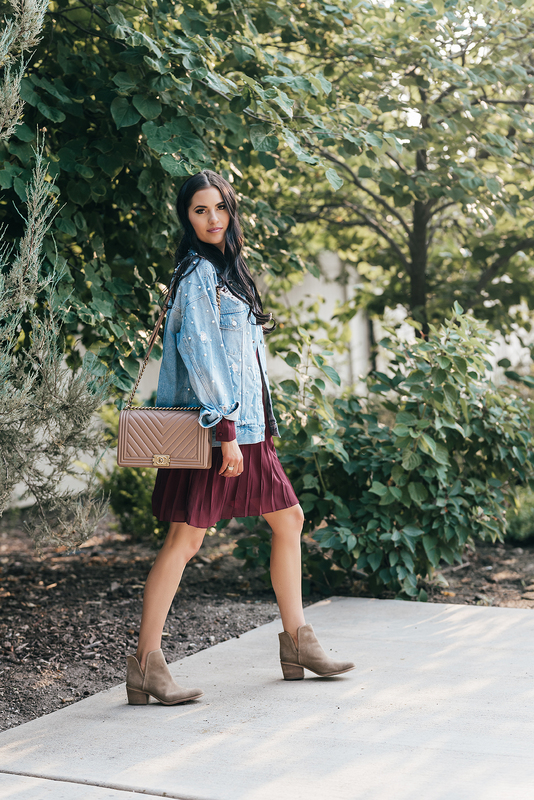 Love the flowy burgundy dress paired with those perfect neutral booties and denim jacket. Love the bag too. You’re looking so charming here! Beautiful burgundy dress and such a cool denim jacket! In love with those booties! Such a great fall staple. 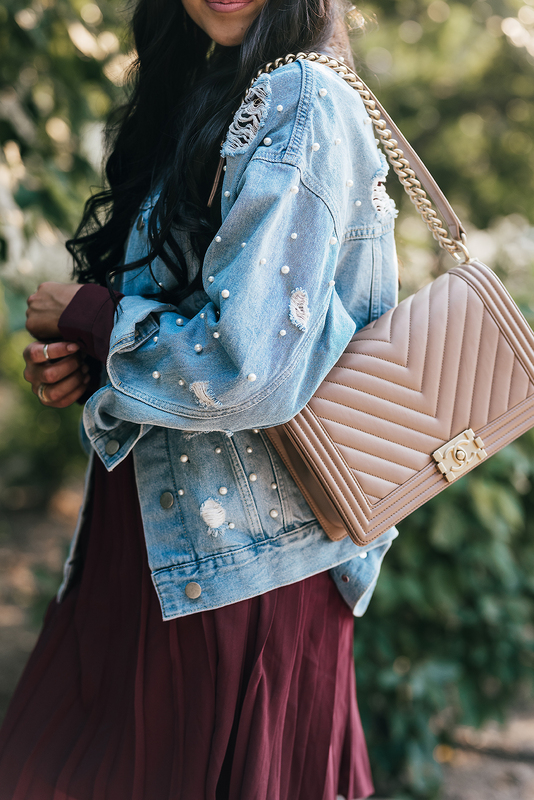 Obsessed with this pearls jacket!! Me too!! I can’t wait to wear it more this fall! Loving burgundy for fall! Such a cute dress! This dress is so pretty! I love the pleats and burgundy too! This dress is SO gorgeous! I absolutely love the color and how you styled it! I love this dress so much! It’s such a versatile piece. I am dying over this look girl! That dress is amazing, and I love what you paired it with! I am so excited for fall! We’re still pretty warm down south. This dress is amazing! Totally snagging on right now! Loving that dress and the adorable little pearls on that denim jacket!! I love this dress from your collection, Rach! The color is indeed perfect for fall and I love how it looks paired with the denim jacket for a more casual vibe. Thanks for sharing and I hope you have a great week ahead! 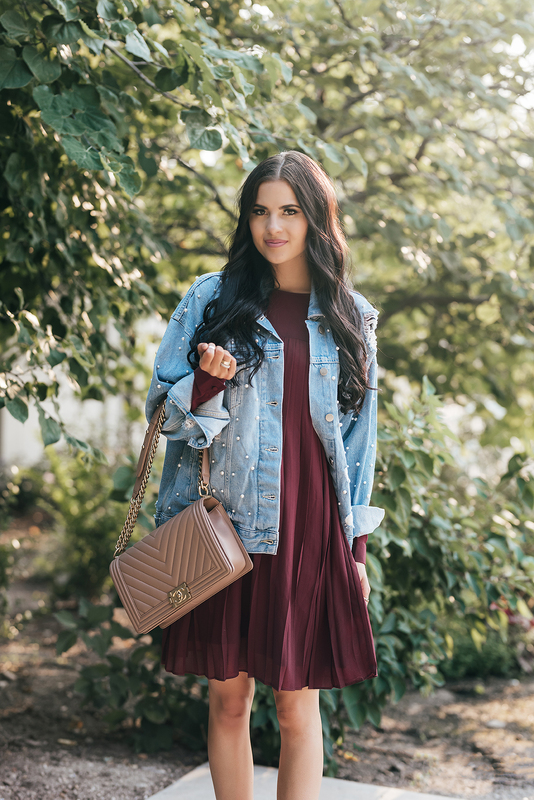 Love the way you paired this oversized jacket with this feminine dress – so cute! Lovely dress in such a beautiful color! Love the Harvest Burgundy Chiffon Dress. Are you getting anymore xs? There might be some that are returned!! So keep checking the site! Love this look, your style is amazing! Loving this dress on you Rach! Can I ask what size you are wearing? I am always wary of trapeze type dresses like this looking huge on me!